Thanks for looking at our new 2019 ATC Toy Hauler! We just got this one in and it is ready to haul all of your toys! This is a ALL Aluminum toy hauler with tons of extra options. 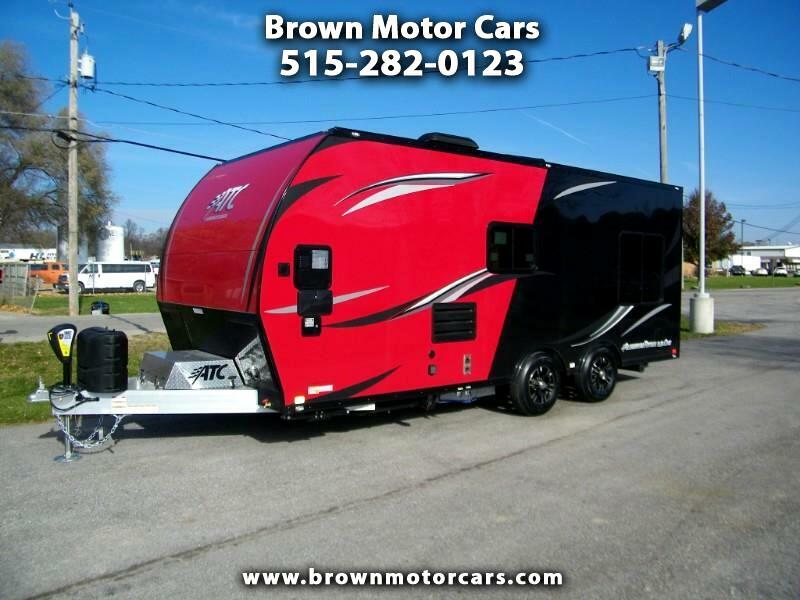 It features 3,500lb torsion axles, two tone exterior w/blackout trim package, aluminum wheels w/radial tires, Power awning w/full length LED light strip, AM/FM stereo w/indoor and outdoor speakers, ducted A/C and furnace, fold down dinnette, fold down couch/beds, Happijac power drop down bed, full bathroom, convection oven/microwave, 2 burner stove top, refridgerator/freezer, 3 season plumbing package, removable carpeting, electric tongue jack, exterior shower and water spigot, solar panel, 2 batteries, recessed airline track, cables to make ramp door into patio, and tons more! Plus this has a all aluminum floor which makes cleanup very easy after hauling your toys! Give us a call with any questions or stop out and we can show you what these toy haulers have to offer!